I've just spent the past two hours going through the entire list of those that have died in this war that we are currently in. Yesterday marked the day that there have been 1000 fatalities just in this war. I've looked at all the names...seen where they were from...seen how old they were. I'm so saddened at all the loss but so grateful that they sacrificed their life for mine...for ours. I'm at a loss of words of what to say to these brave men and women. Thank you just doesn't seem like enough. They've left behind families, friends, jobs, churches, memories, the list goes on. Nate and I saw a movie recently and it opened my eyes up just a little bit to what these men and women experience both in battle and when they return home. If it touched me the way that it did, what has it done to their hearts, souls and minds. The things that they have seen and had to do are unlike anything that we will ever have to do in our lifetime. Thank you, fallen ones, who have stepped up to the plate and fought for our freedom. Who have left loved ones and life, as we know it, to fight and fight hard. I pray for the families and friends who you've left behind. I pray that they would continue to be comforted and that they would have peace that you died doing what is noble and right. Thank you to those who are still serving. May God protect you and bless you for what you are doing. I thank you for doing this so I can be free. Thank you for wanting to change the world and to hopefully make it a safer and better. May the day that we celebrate tomorrow not be about garage sales, cook-outs or just another day off work. May it be a day that we reflect on you - those who have fought hard for the USA. 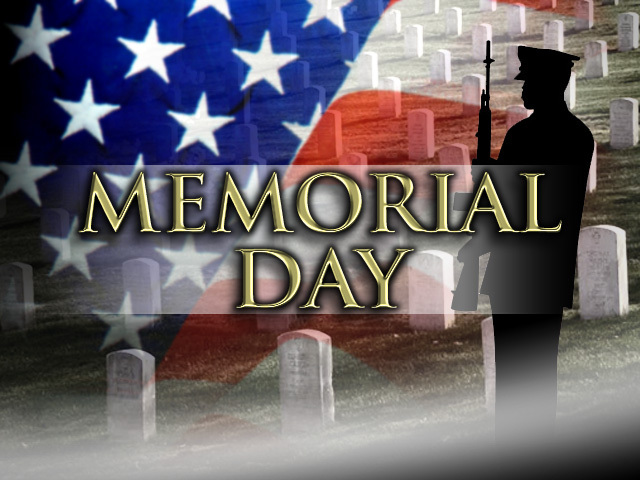 For the lives that have been lost and for those who are currently on the battle field. Thanks for serving! So it's been awhile! Sorry for my almost two month hiatus...it's been a whirl wind of a few months but I think I can finally say that I'm back! Yeah! I sure missed blogging but it was somewhat refreshing and somewhat eye opening at the same time. Makes me almost feel like God does with us when we don't talk to Him! Things have been great and are just beginning to start back up again. I've been picking up the slack in the office for a couple of gals being on maternity leave so it's been a little hairy at work but I've survived! They're both coming back next week and the week after so I'll be back to normal in the next few days. Makes me appreciate them all the more ;). 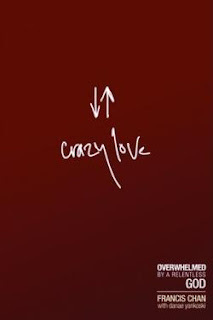 My small group just got done with the book "Crazy Love" and it made me want to change my thinking on a few things. I've always thought of God as being more reverent and holy but I want to try to think of Him more as Abba, Father, Daddy. A little different for me to wrap my head around but I want that personal side to my relationship with Him. It's a great book so if you haven't read it, pick it up and give it a go. We're starting a study of the book of James so I'm really excited about jumping into that next. I've also been trying to plan out activities for the kids and Nate to do during the week for the summer. I'm so jealous that I won't be able to join them! There's a lot of fun stuff planned from the summer movie series at Cinemark to free bowling to gymnastics camp! It's gonna be a good one! I've also been trying to work on a few projects that are getting up off the ground rather slowly but I'll kick it in gear soon. I've also been keeping up with menu planning and coupon saving so that's been exciting! Along with all that, I've been planning Nate's and my trip to Chicago in November for our 10th anniversary. I can't wait for a vacation! We're not really going away this summer (other than camping) so this will be our vacation for the year. It's gonna be great! Nate has been doing well. Still adjusting to being a stay at home dad! By the time he gets adjusted, both girls will both be in school. I think he's looking forward to the summer and being more active instead of being cooped up in this little house! He's started tournament fishing which he loves so that's been great for him to get out with other men. He seems to be doing pretty good too! He would love to get a boat one of these days so I told him to start saving pennies and one day we'll get there! He's looking forward to camping, fishing, and heading to Nashville this summer. Aiva is doing great in school. She loves math and spelling and she's just plain a smarty pants! She is so helpful with Ana but on the other hands they love to fight like cats and dogs. She has a new friend next door and her name is Sunrise. She wants to do everything with this girl! Sunrise doesn't come from the best home environment so we're trying to be good examples while hopefully not scaring our own kids! Aiva's looking forward to gymnastics camp, Round Lake camp, and soccer for this summer. She's still trying to find her niche with what she wants to do so we're still exploring our options. She's very smart and crafty but I'm not sure she's real athletic! We're still working with her though! Ana is just plain ornery! Nate and I crack up all the time at how witty she is. She always has a smile and a joke that she readily hands out! She loves preschool and will tell you if you ask who the trouble maker is in school. She loves Ms. Mindy and can't wait for her spring show where she gets to sing a few songs that they've learned in class. 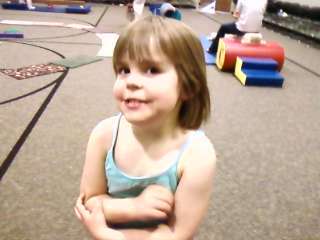 She's in gymnastics at church and LOVES it. She's the oldest of the class but that doesn't bother her...she knows what she's doing and is adamant that she wants to do things on her own while in class! She will be in the 4's/5's class in preschool next year and we're hoping that Ms. Mindy will be in her class but we'll have to see! She can't wait to be in class for 3 days instead of 2 days! She loves writing her name and will watch Mulan (the Disney movie) all day if you let her. I think that should catch you up on a few things until next time! I'll enjoy getting back into blogging again so stay tuned for what's on the horizon with me. I've enjoyed staying up with all my pals blogs so thanks to you all for keeping up while I took a break! Hope you're looking forward to summer! See you around!